I’m already dreaming of the weekend. Well, I don’t have any big plans, but most often, this weekend each year is filled with lots of relaxation, bike rides, some house/yard work (if I get around to it), and lots of good food (most often including barbecue ribs and homemade ice cream). It’s just right time to start thinking about a menu and isn’t dessert the logical place to start? We are always full after eating the barbecued and homemade treats during the weekend so I wanted to try something light and refreshing for dessert. Easy Strawberry Shortcake with Cream Cheese Frosting is the perfect finish. It is simple to make with just a few steps, plus Your freezer does most of the work which means you can spend more time outdoors having fun. It looks like a win–win deal. Easy Strawberry Shortcake will take only a few to whip up and with a little creativity can be an adorable addition to your holiday table! Preheat the oven to 350 degrees F. Grease bottom of 9x13 baking pan and line bottom with parchment paper. Bake at 350 degrees for 25 to 30 minutes or until toothpick inserted comes out clean. Invert onto a flat surface. Peel away parchment paper, and cool completely. * Freeze for about an hour to make carving easier. Once cooled, you will need a large serrated knife in order to cut all of the layers. Slice cake evenly horizontally into three layers. Set aside. 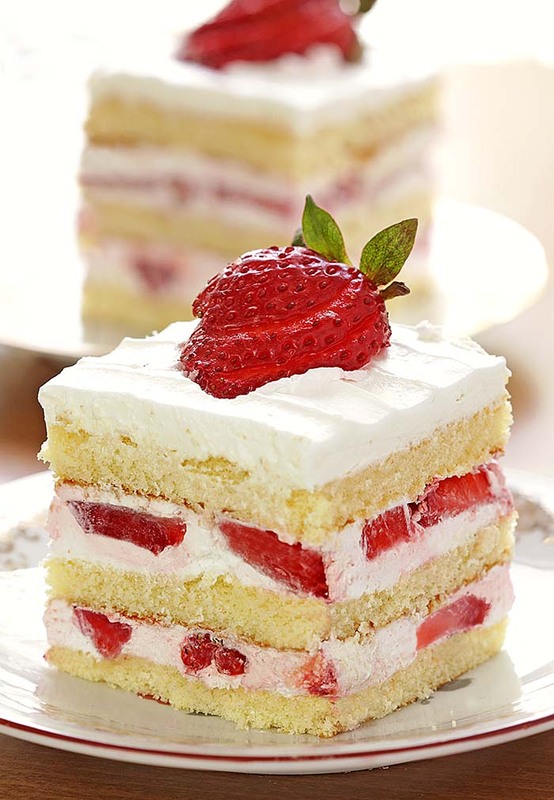 spread a layer of whipped topping over it, then arrange strawberry slices evenly over the whipped topping. Take a second layer of cake and spread a layer of whipped topping over it, then place it, whipped topping side down, on top of the already built cake/whipped cream/strawberry layer. Repeat the whipped topping-strawberries-whipped topping-cake process 1 more time (2 times total). In a bowl, beat the cream cheese, powdered sugar and 1 tsp vanilla until smooth. Fold the 1 cup whipped topping into the cream cheese mixture. Spread across top of the cake, reserving some of it to pipe rosettes if desired. Run a spoon or a fork through the top to make stripes. Cut into squares. 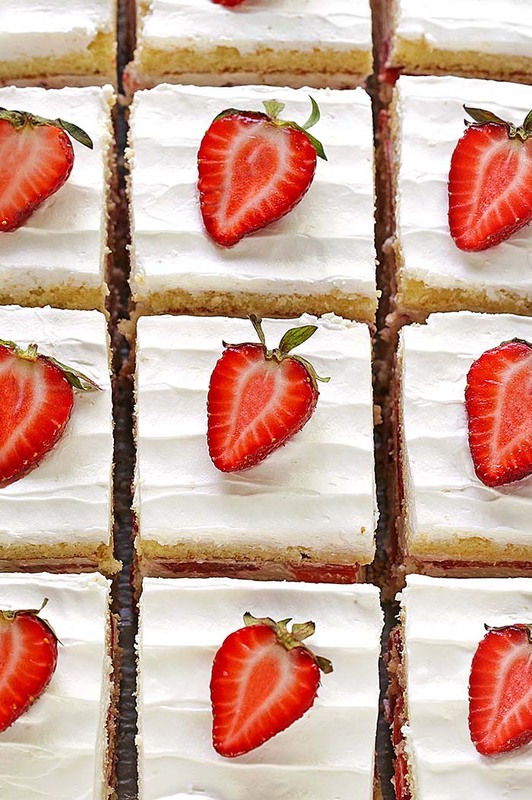 Garnish each square with strawberry half and rosette (or just a blob) of frosting if desired.